When the Tagish Lake meteorite crashed to Earth six years ago, researchers suspected that it could provide one more clue to the origin of life, but instruments were not yet sophisticated enough to confirm a connection. That connection could soon turn up, as a team of NASA researchers recently reported finding organic material in the meteorite fragments that pre-dates the solar system. Researchers have long speculated that comets and meteorites could have brought the basic ingredients of life to ancient Earth, especially some important simple organic molecules such as amino acids. Organic materials, such as those found by the NASA team, might have played some role in the pre-biotic development of early life, the team reported Dec. 1 in Science. "We may be one step closer to knowing where our ancestors came from," says Keiko Nakamura-Messenger of NASA's Johnson Space Center, and lead author of the new study. 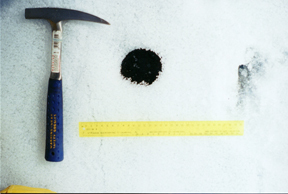 The Tagish Lake meteorite  the black rock shown at right, next to the hammer for scale  crash-landed on the frozen British Columbia lake in 2000. New research suggests that the meteorite pre-dates our solar system. Images are copyright of the University of Western Ontario and the University of Calgary. The meteorite, which landed in British Columbia in 2000, contains tiny hollow globules whose carbon-rich shells may have been containers for early organic molecules. Although the existence of globules is not news  they were recognized several years ago  it wasn't until last year that NASA had instruments powerful enough to analyze the globules' nanometer-thin walls, and until now, their composition and origin remained unknown. The team's recent analysis revealed that the isotopic signature of these walls, or rinds, is very different from what we find in our solar system. The rinds are composed largely of carbon, but also contain hydrogen, nitrogen and deuterium. Their unusual isotopic signature "immediately identifies this material as not being of solar system origin," says Peter Brown, a meteor physicist at the University of Western Ontario, who co-authored the first Tagish Lake meteorite Science paper in 2000. "It's not homogenized with the rest of the isotopic soup of the early solar system," he says. "If you started sampling birds, and trees, and people, and organic slime at the bottom of the ocean, you would get a certain range of carbon, hydrogen and nitrogen ratios," says Alan Hildebrand, a planetary scientist at the University of Calgary, and a co-author on the 2000 Science paper. "And that's all you would find, so the fact that [Tagish has] different isotope ratios tells us that the material came from somewhere else: It can't be terrestrial in origin." Indeed, Nakamura-Messenger's team's research on isotopic ratios showed that the globules formed at about negative 260 degrees Celsius, near absolute zero. Such extreme conditions have never occurred on Earth or anywhere in its neighborhood in the history of the solar system, Nakamura-Messenger says. For this reason, she suggests that the meteorite's material originated either in the Kuiper Belt  the family of bodies orbiting beyond Neptune  or more likely, in the molecular dust cloud that would later collapse to form the solar system. But how that organic material came to exist on a meteorite on Earth is another question. Scientists suggest that when ice grains in molecular clouds get close to a young, hot star, the star's ultraviolet radiation changes the ice into an organic substance. During solar system formation, the globules were incorporated into small structures, which then stuck together to form asteroids, planets and in some cases, the rocks that would eventually crash to Earth as meteorites. "Knowing now where things fit in, that's exciting," Brown says, "because previously people didn't known whether this organic material was created in the asteroid itself." These structures, he says, "are clearly not formed in situ in the asteroid." 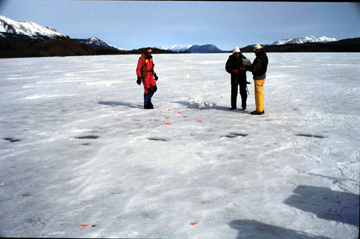 After collecting fragments of a meteorite that crashed to Earth on the frozen Tagish Lake in British Columbia in 2000, researchers have been working to analyze the meteorite. Brown was alerted to the meteorite's existence in 2000 by the Department of Defense's space-based sensors, which detected the shower of fireballs. Usually, meteorites come in over the Pacific and are lost in the ocean, he says, but this one crash-landed on the frozen Tagish Lake. Jim Brook, a local resident, collected many fragments in plastic bags, careful to avoid contamination, and kept them frozen. "The nice thing about Tagish Lake is that there is a lot of pristine material," Brown says. Tagish is "the sort of material that would have bombarded the early Earth with great frequency," possibly setting the stage for the development of life. The same is probably true of most planetary systems in our galaxy, however, Hildebrand says. "Organic does not mean produced by life, but just containing carbon, hydrogen, oxygen and nitrogen." Life on Earth is carbon based, but carbon exists throughout the atmosphere, he says. "I think [the team's] work is very significant, but I think the origin of life thing is hyped," he says. The real significance of the recent findings, he says, is the insight they provide into the chemical processes inside molecular clouds. "It's quite exciting that they've been able to show that these components are pre-solar and infer their place of origin."